This Sunday, May 20 (in the U.S.; Monday morning on the 21st for Asia) there will be a spectacular eclipse of the sun. Residents of the western U.S. get a great show; those on the Eastern seaboard get to see nothing. Details on how to see the eclipse can be found here from Sky & Telescope and on many other websites. Rather than reproduce others' details on how/where/when to look, I thought I'd put a personal spin on the story and mention a few things I haven't seen on many other websites. Solar eclipses are caused when the moon comes between the Sun and the Earth; basically we see the moon's shadow. The moon's orbit is tilted with respect to the Earth, so most months the moon passes well north or south of the sun in the sky, but every 6 months it has a chance of passing over part or all of the sun. The moon and the sun are almost exactly the same size, as seen from the Earth. But the moon's orbit is not a circle, it is elliptical (oval), so sometimes it is a little closer to the Earth and sometimes a little further away. Remember a few weeks ago when the "Supermoon" was big news? I was in an ice cream shop when one of the other patrons saw the full moon rising and shouted "It's the supermoon! Look how big it is! Let's all go look! Supermoon!". You can see some pictures of the Supermoon here. The reason for the "supermoon" was that the full moon was almost exactly coincident with the moon's closest approach to Earth, so it was fully lit at the same time it appeared largest in the sky. We are now 2 weeks after "Supermoon". The moon takes about 4 weeks do a complete orbit around the Earth, and if it was at its closest two weeks ago, it is at its furthest point from the sun this Sunday. This means the moon will appear the smallest it can in the sky, and, in fact, it will appear slightly smaller than the sun. So, during this weekend's solar eclipse, the moon will try to fully cover the sun, but it will be too small to do so, and we Earthlings can see what is called an annular eclipse, where the sun will be visible as a ring around the dark shadow of the moon. Because the sun is not fully blocked, viewers must take care to protect their eyes. It may not hurt to look at the eclipsed sun, but harmful radiation from the sun will be very quick to permanently damage your eyes. Solar eclipse aficionados are aware of something called the Saros cycle. Every 18 years and 10 or 11 days the Sun, moon, and Earth are in almost exactly the same geometry, so a very similar eclipse can be seen. 18 years and 10 days ago was May 10, 1994. That day there was another annular eclipse of the sun, this one visible from much of the United States as well (a bit of a coincidence, since the eclipse path moves 120 degrees west each 18 years). And on that day, the moon's shadow passed straight over my grandmother's house in northern Indiana. Since I had a good excuse to visit my grandmother, I did so. (I had just finished my sophomore year of college a few days previously). Here my grandmother is looking at the eclipsed sun through a mylar eclipse viewer. These are safe to observe the sun through. 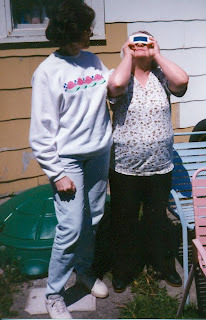 Grandma was just starting to suffer from the early stages of Alzheimer's, and so she tended to forget what we were doing. But she still enjoyed the experience and the views. Here is my little refracting telescope. 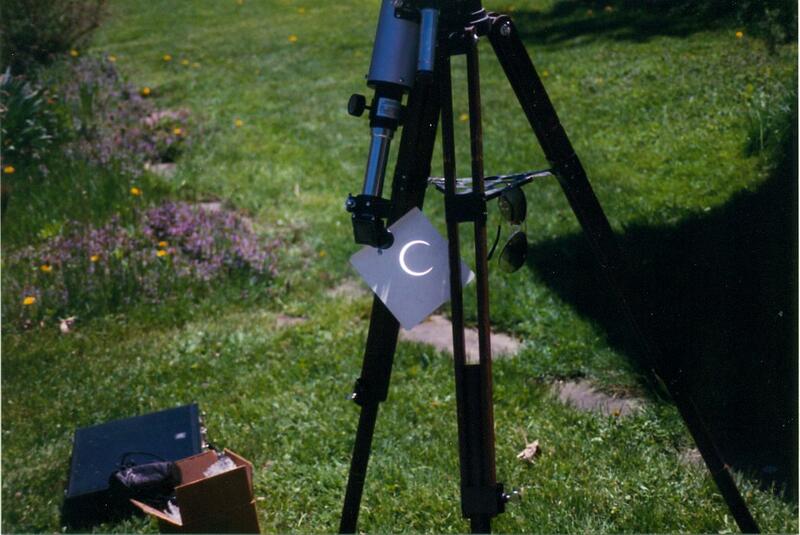 Because it is highly dangerous to look at the sun through a telescope, we projected the sun's image onto a screen. I actually had a really nice filter that went over the top of the telescope to block the sun's light for safe solar viewing, but another advantage of projecting the sun's image was everybody could see it all at once. From this view you can see that the moon is smaller than the sun and going to easily fit inside the sun. This view is of the sun during the annular portion of the eclipse. You can see the sun fully surrounds the moon. Another fun thing to do during solar eclipses is to use your hands to make pinhole cameras. In this picture, my mom is off to the left and holding her hands at right angles to make a cross-hatch pattern with her fingers. The gaps between her fingers let little bits of sunlight through, and in the shadows of her hands on the white board below you can see several little images of the sun. Since it is an annular eclipse, we thought it was fun to make lots of "olives" with just our hands. Any small hole acts like a pinhole camera. 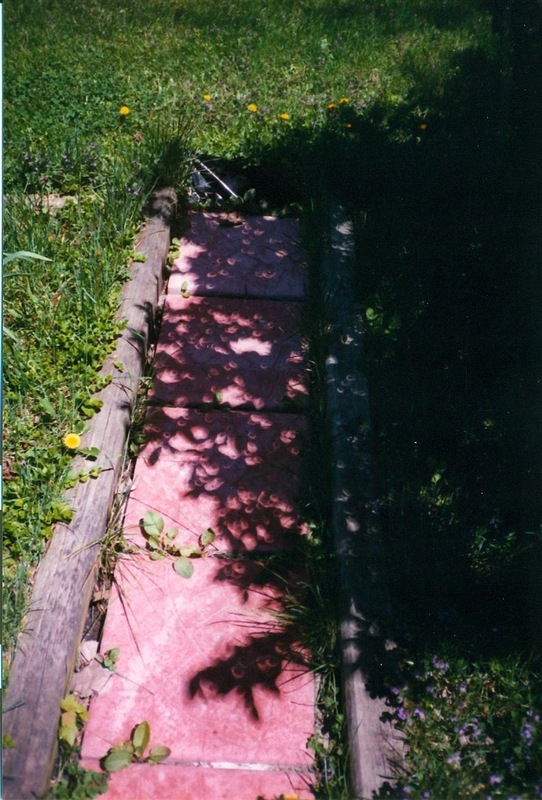 After the annular part of the eclipse, I took this picture of the sidewalk near a flowering shrub. The shrub's leaves allow little patches of sunlight through, which you see here as a myriad of little crescent suns. This same phenomenon works when the sun isn't eclipsed; if you look closely at the dappled sunlight and shadows under a tree, you'll see that the sunlight is really a series of circles - hundreds of pictures of the sun projected on the ground. If you live in the western U.S. and have clear skies on Sunday, go take a look! Just be safe - never look at the sun without protected eyes. Sunglasses aren't good enough! If you don't have mylar eclipse glasses, welder's glasses #13 or #14 will work, otherwise project the sun's image by putting a pinhole in a piece of paper and holding it above another surface (or just use your fingers). 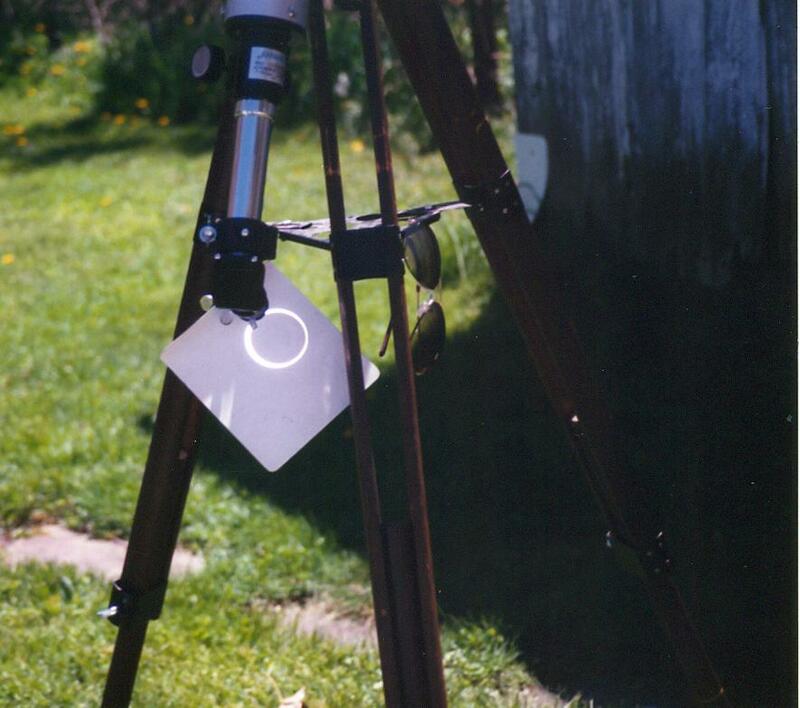 Again, don't look at the sun through the pinhole! Details on where to see the eclipse are in the Sky and Telescope article. The eclipse path goes through several national parks, and many of them will have special viewing events. If it is cloudy or you live too far east, you can also watch the eclipse online. If you miss this eclipse, there will be more. Looming on the horizon is a total solar eclipse in August 2017, which crosses the entire continental U.S. I also saw portions of the last total eclipse of that Saros cycle from a hill on the French-German border in August 1999. Hopefully in 2017 I won't end up quite as wet as in 1999. You forgot to write that If you look directly in the sun you can damage your eyes. Do not look at the sun during the eclipse with the naked eye or even with sunglasses, use an approved solar filter, solar glasses (http://amzn.to/JVibhG), or solar projection system. Attempts to use a binoculars, telescope, or other optical viewing device without a proper filter will likely result in instant and permanent eye damage! Viewing the amazing ring of fire is hazardous to our eyes. What I usually do is focus a telescope and put a photo film under then a video recorder. The ring of fire really looks great. Yes it is true that it will cause permanent damage to our eyes, but isn't that already given? Since we were kids, we hardly can't look straight into the sun because our eyes would hurt and then temporary blindness kicks in. Ordinary sunglasses can't fully protect us, special films or coating in the lens is needed to enable us to view the sun directly.